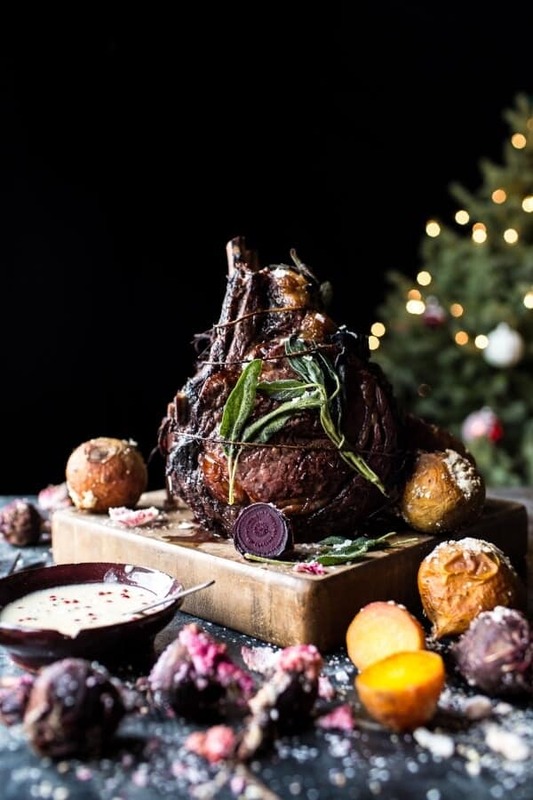 Sage Crusted Standing Rib Roast with Gorgonzola Cream Sauce. I would say they might be pumped but then I know my brothers, they’ll just say, what’s that green stuff? Good news is that sage leaves can slide right off, the other good news is that I took this roast for a test run over Thanksgiving and to say that it was well received would be an understatement. Simple GOOD flavors – everyone loved it. Plus, they were all just happy for steak. Somehow I am a veggie loving freak in a family full of meat loving boys. Odd the life you’re handed, huh? If I wasn’t feeding the family and their friends, I’d honestly roast veggies 24/7…you see those amazing colorful things I snuck in there? Yep, I threw some beets in with this steak. Ok, so I know that just about all I ever talk about now is Christmas, but I just can’t help it, I love it! That said, I am already SO behind on Christmas it’s not even funny. This has happened every year since I started the blog, so I really shouldn’t be surprised. One of these days though, one of these days very SOON, I will dedicate the entire day (ok, maybe not the ENTIRE day – but most of it!) to doing all things Christmas. Anyone else with me?? Little sis for sure is with me. In fact she has been planning out “Christmas Day” since before Halloween. I have about twelve post it notes stuck to the chalkboard in my office detailing all the things we will do on this day. The girl knows how to make a good list… Santa, be prepared. OH and you guys, serious talk here. Did you know that mean girls exist… even in first grade?!?! Asher was over on Friday night (cause I am LAME and I hang with my seven-year old sister on Friday nights) and she was telling me about one of her friends who created a “team” that only she is the boss of. Only this friend is allowed to tell everyone in the group what to do. She tells them who to talk to, who not talk to and what to play, even what to wear…wow, mean girls the 1st grade version! I know, I know. Craziness, right? My smart little sister wanted nothing to do with this “team” (GO ASHER! ), so she opted to be OUT of the group. The problem is that now all of her friends are in the group and they aren’t allowed to talk to her. She came home Friday totally sad. I mean, is that not so mean? They are SEVEN years old! I am not really sure I remember all that much from being seven, but I can’t recall any mean girls. Ok moving on, let’s talk about this Sage Crusted Standing Rib Roast. I will not lie, this is a serious roast, it feeds a crowd, or well eight hungry people, but you know. It’s also kind of a show stopper, like an “ooh ahh” as it comes to the table show stopper. Best part is that its super simple and easy. Worst part? It’s got a hefty price tag. I can’t deny, this is a cut of meat for special occasions without a doubt. I’ve decided it’s worth it though, not only does it make me happy, since there’s really not a lot of work involved, but your guests (or in my case occupants – some related, some not) will love this delicious splurge. Season the beef with salt + pepper…of course. Sear the beef on the stove to get a beautiful, golden brown crust. 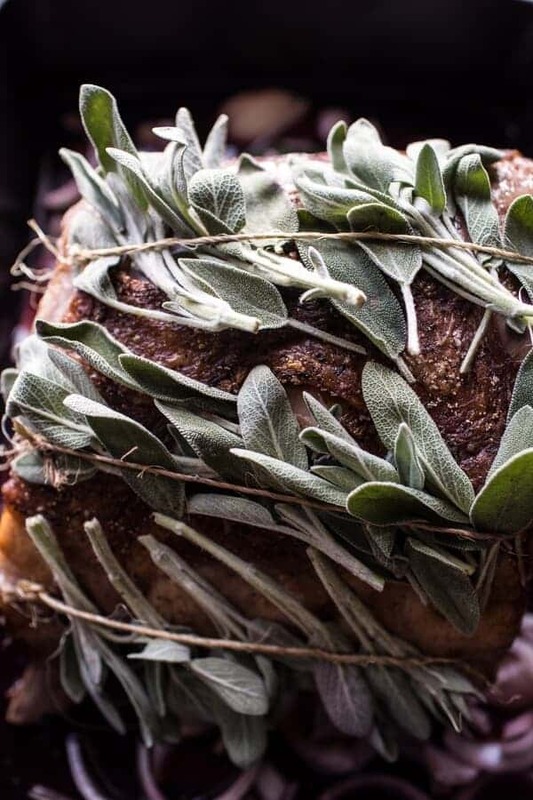 Secure a whole bunch of sage to the roast with kitchen twine. Add some onions + red wine to a roasting pan, then add the roast. Roast away for a few hours until the beef is done to your liking. My family likes their beef cooked pretty dang pink inside. Clearly. While my cousins on the other hand, actually like their meat pretty cooked (I am talking COOKED!). 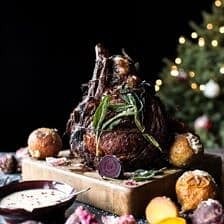 So how I will cook this on Christmas Eve is still a question I am trying to figure out. Maybe two roasts? I dunno, we shale see. OKAY. But my FAVORITE part to this recipe?? Yup, the gorgonzola sauce. You guys know me so well. Bring on the stinky cheese please. No but seriously? This sauce is all kinds of incredible. It’s buttery, garlicy, creamy and cheesy. The gorgonzola cheese really gets mellowed out by the cream, so even if you’re not normally a fan of blue cheese, I would still recommend trying this. If you really just can’t handle the stinky cheese, you could use something like a sharp cheddar, gouda or Gruyère. Just don’t skip the sauce. Any cheese will be delicious and it’s the PERFECT compliment to this simple beef roast. And I mean, come on. Aren’t those pink peppercorns so festive. Love. I also cooked up some salt roasted beets to go along side the steak. 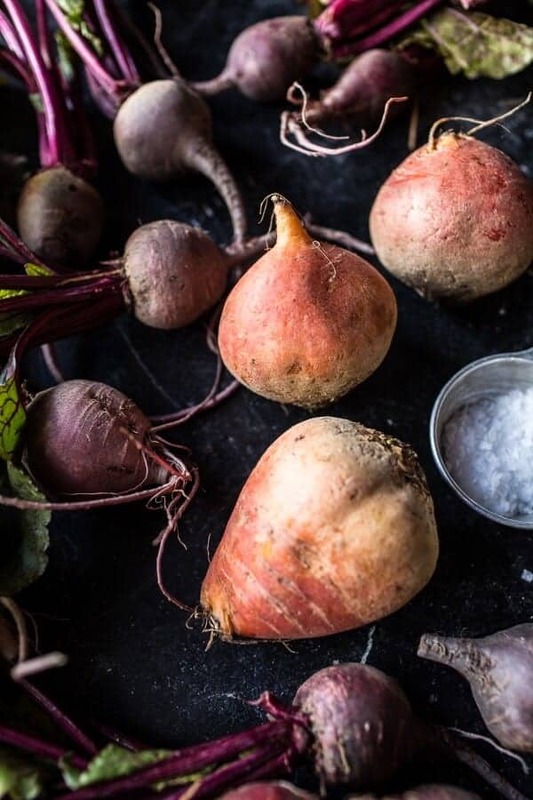 I am REALLY into beets right now (as you will soon see) and this simple way of preparing them is one of my favorites. I know it may seem like SO much salt, but I promise it’s going to make for the best roasted beets. 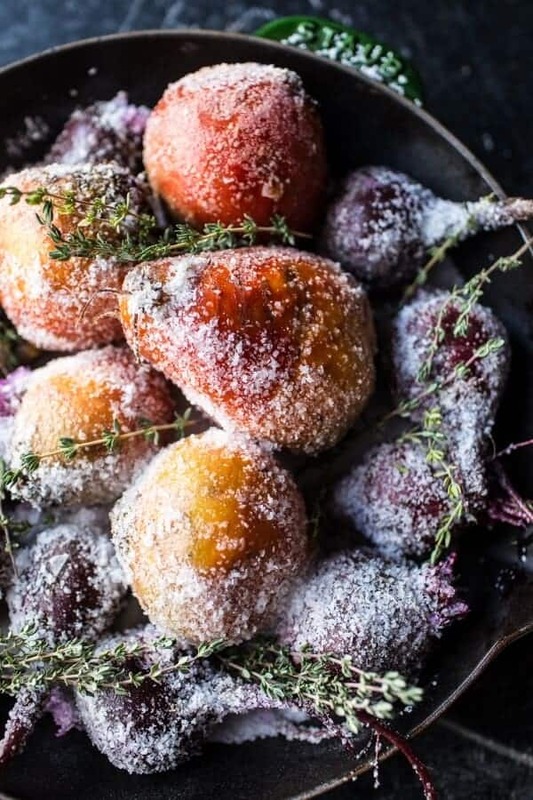 The salt gets brushed away before eating, but leaves you with a perfectly roasted beet. So much flavor. So much color. All the things I love! Geez. I just realized that I wrote WAY too much for a Monday. Sorry, my brain is go, go, go – only seventeen more days till Christmas! Wait, one last thing! It’s VIDEO time!! I am beyond excited to be back with videos for you guys this month. They are definitely not perfect, but Kai and I, we try! Hope you guys love it. Please let me know what you think, I love your feedback!! Heat the olive oil in a large skillet over medium high heat. Once the oil is hot, season the beef generously with salt + pepper, then sear the beef in the hot skillet on all sides, about 4 minutes per side. Remove the beef from the skillet and place on a cutting board. Rub the sage with a teaspoon of olive oil. Place the sage on the beef roast and secure with kitchen twine. Add the onion and red wine to a roasting pan. Place the beef on top of the onion, cover with foil. Place in the preheated oven for about 25 to 30 minutes, then reduce the heat to 350 degrees F. and continue roasting for another 1 3/4 to 2 hours. Occasionally, throughout the cooking time, spoon some of the juices over the meat. If the liquid level in the pan goes down too much, add the remaining 1 cup of broth. During the last 30 minutes of cooking, remove the foil and allow the sage to get a little crispy. Check the temperature of the meat by inserting an instant-read thermometer into the center of the roast. 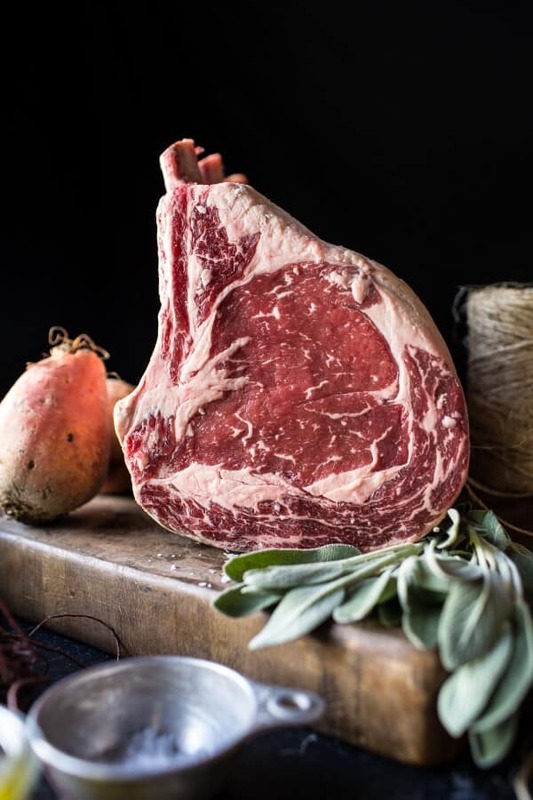 For medium-rare it should be 125 degrees F. and 130 degrees for medium. Remove the roast from the oven to a cutting board and let rest for 15 to 20 minutes before carving. Meanwhile, make the gorgonzola sauce. Heat the butter, olive oil and garlic in a small saucepan set over medium heat. Cook until the garlic is soft, caramelized and fragrant. Add the wine and cook until reduced by 1/3, about 5 minutes. Stir in the cream and gorgonzola, cook until melted and smooth. Add the pink peppercorns and season with salt to taste. Keep warm until ready to serve. 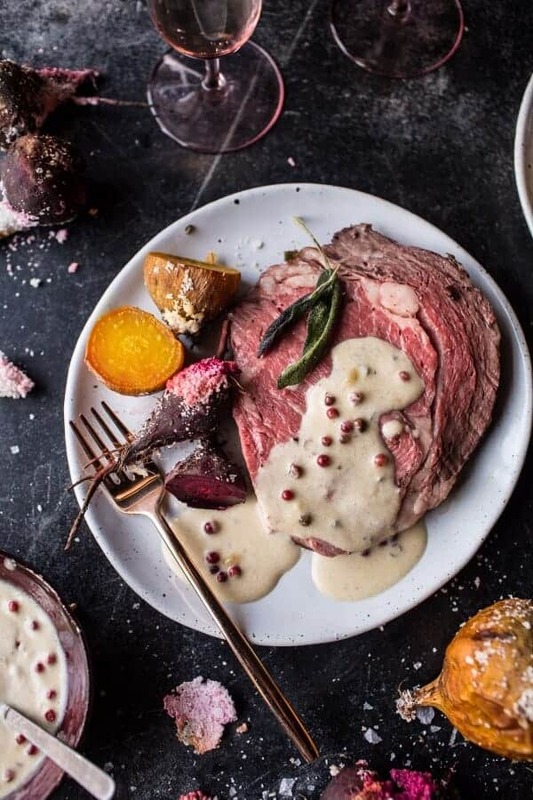 Remove the kitchen twine from the beef, slice and serve with the gorgonzola sauce + beets (recipe below). Happy Holiday eating! Add salt to the bottom of a roasting pan so that the bottom of the pan is fully covered in salt. Snuggle the beets into the salt. Roast for 45-55 minutes, rotating the beets twice, until the beets are soft. The cooking time will depend on the size of your beets. 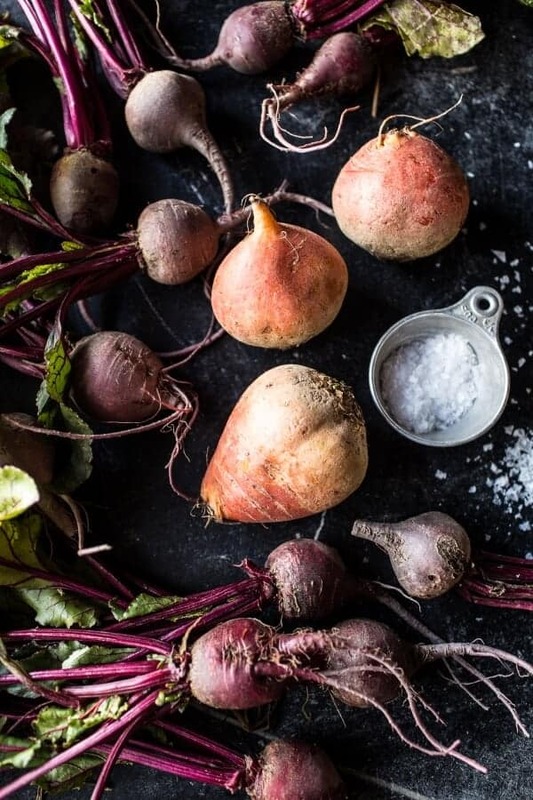 Remove the beets from the salt, brushing any excess salt off. Drizzle the beets with olive oil and slice into bite size pieces. Serve along side the steak. 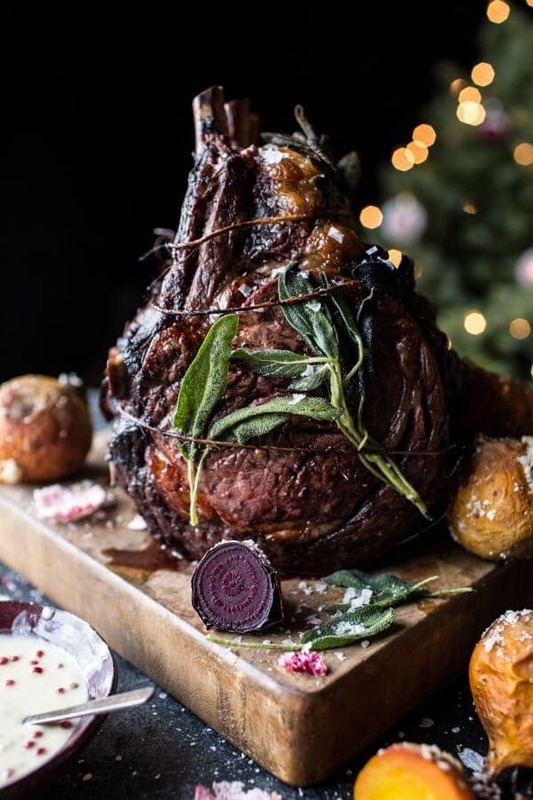 *If you are feeding less than eight people, a smaller roast can be used, just adjust the cooking time to ensure your beef is cooked perfectly. SOoo? Christmas Eve?? Dinner? For sure. P.S. Don’t forget to enter my Staub giveaway here (at the bottom of the post). it sounds like you both could use a christmas day! as for trying to cook the meat so that everyone likes it: my dad cooks it medium-rare, and then people can grab the less done middle or the more done edges. or they can microwave it for 15-30 seconds. not the most sophisticated solution ever, but it works! We like it rare too, but that’s a great idea for people who don’t, pick around the edges. Honestly Tieghan, I don’t know how you made raw meat look good. Mind-blowing. Omg, that’s so awful about Asher’s friends. My little sis is 7 too and I know how dramatic things can seem to them I’ve been remembering how big of a deal things seem when you’re that young and you have nothing bigger to think about. 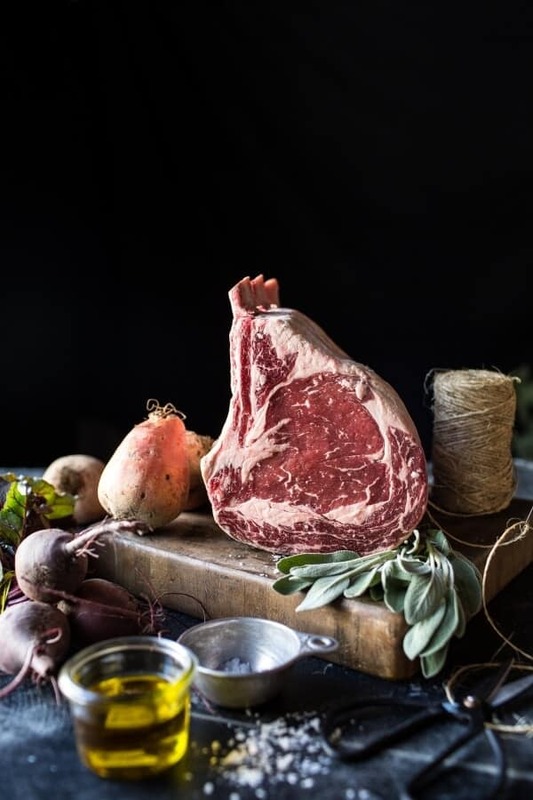 As for this recipe, I’m with you Girl, bring on the stinky cheese sauce to go with this gorgeous piec of meat! Love the video Tieghan! I actually remember being six and having mean girls in my class, and they did precisely the same: layed down the law to what you could do, wear, play with and who was likeable or not likeable this week… said, really. I also remember being 9 or 10 and being the mean girl, which is even sadder, honestly!!! Now, this standing rib has nothing sad about it, only glorious joy and cheerfulness!! What a lovely dish – and I also loooooove roast veggies!! Little girls can be so harsh and mean!! What an awesome sister you have to acknowledge how “not cool” that group really is because of what they are doing! Smart girl for sure! -However, not smart on your part for posting something so absolutely stunning and amazing that you’ve got me over here wanting to lick my computer screen 😉 THIS LOOKS TO DIE FOR! Love the video…do you eat the beet peals when they are roasted? I do, but some people prefer them without. it is really personal preference. Thanks!!! You had me your photos, then I looked at the recipes. I hope mine comes out this nice. Wowzers – this looks and sounds insanely delicious! What a show-stopper of a main meal. I’m definitely gonna make this before Dec is done!! ? Looks wonderful. Christmas is always Prime Rib so I am always on lookout a different recipe. What other cheese would you suggest for those guests who do not like Gorgonzola? Girls can be mean no matter what age they are but its sad your sister is going through that. 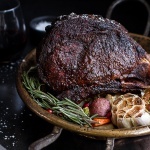 She deserves a extra helping of this gorgeous standing rib roast. Totally gorgeous Tieghan! 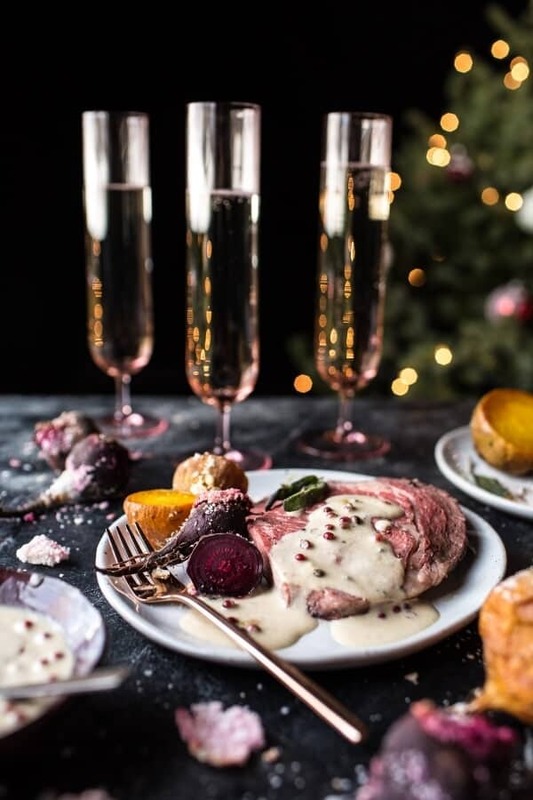 Looks like the PERFECT holiday dinner! Love that sauce! Man! Poor Asher!! It just made me want to be 7 too, so I could be her “uncool” friend! Makes you wonder why all the other kids are signing up to bossed around…Miss Asher is making a very mature decision, though that’s got to be hard. It’s hard to be the strong one when you’re 7, surrounded by peers and all you want to do is fit in and be liked. ‘Cause most little kids aren’t thinking about the bigger picture and hard times making you stronger for even more trying situations down the road. ? You know I love seeing you cook!! Kudos to you and Kai for being willing to get out there and just. start. even when you don’t feel 100% confident about the whole process. Many people (myself included) want to have everything perfect/learned to near-proficiency before we even begin. And I personally think every video you’ve put out improves with quality and smoothness. Though, as always, I like the ones that include more real-life moments, family cameos, etc. ? I’m a creepy-weird reader like that. All these flavours. I can’t deal. I need this for dinner tonight. Enough said. This looks delicious and your video is great- it’s all inspired me to try it out! My husband loves gorgonzola and beets so this is perfect. Your video really helped because I was a vegetarian for about eight years and now that I eat meat I have no clue what I’m doing at all but like to cook my own. I can’t wait for your cookbook! What a stunning Christmas Eve dinner! I love the sage crust and that cream sauce… seriously delicious! Go Team Asher! Little do the tiny mean girls realize that your sister has a wide group of older girls and women who support her and her brave, unique coolness. Meanwhile, once again you try to entice me over to the red meat side of culinary life. I still say no, but I cannot but admire (envy) the recipe and your gorgeous photography. Yup, kids can be mean at any age unfortunately. Kudos to Asher for being smart enough to know that’s not cool. Great photos Tieghan! This is a feast for sure! I do recess duty and I see a lot of groups come and go. I try to pull another child who is not in the group to play with the left out child and sometimes it works. Asher has a good heart. Maybe big sister could let Asher invite a new friend over to bake cookies after the holidays. Awesome! Every thing is so beautiful, like it so much. Wonderful video and a really good and easy recipe yet impressive. Happy Holidays! This looks delicious! Do you think it would work in a slow cooker? Thanks Sandra!! I am not really sure. The sage would not get crisp, but I think the flavor would be great! Just be sure you don’t over cook the meat. Let me know if you have any other questions. This looks so delicious! 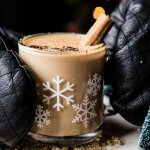 I have to try and make this, perfect for the holidays. Thanks for sharing! This is absolutely stunning. 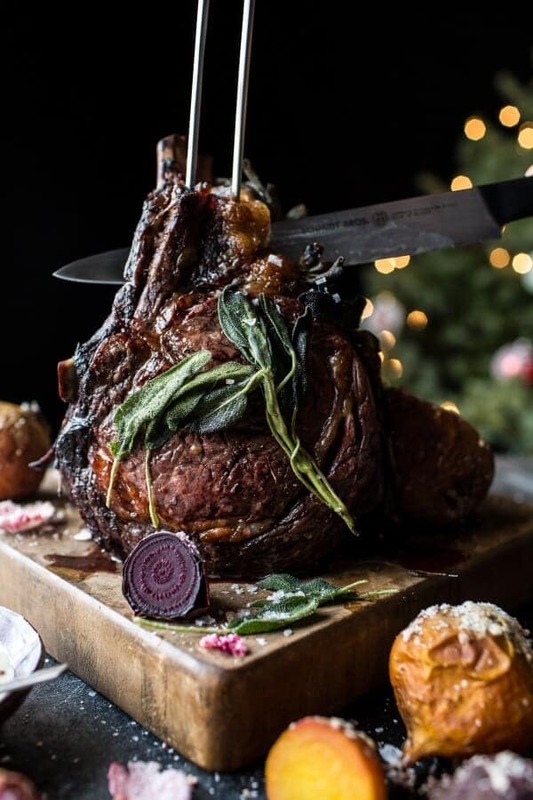 What a beautiful way to enjoy beef during the holidays! This looks amazing! But one question- everyone in my family despises onions. Any ideas for a substitution that would pair well with the red wine mixture? Does anything change when cooking the roast if the one I have to use is boneless? You should cook the roast less. It will cook faster without the bone. Let me know if you have any other questions. Hi Tieghan! 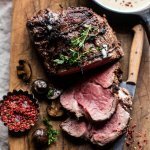 I wanted to let you know that I made this rib roast and Gorgonzola cream sauce for my family’s Christmas tonight! I served it with jeweled pomegranate sesame seed carrots and stuffed mushrooms. It was a COMPLETE success! There are a few reasons for this: 1) I moved into my first non-college apartment this year, and I’ve had a blast getting more comfortable in my own kitchen. (Luckily my boyfriend eats everything I make!) I realized that just one year ago at this time, I never would’ve been able to pull off a meal like this! I’m so proud of myself. 2) I’m known for not really liking beef, and I intended this meal to be a great gift to my beef loving parents, but I had TWO servings! The Gorgonzola sauce was the most perfect compliment (also fabulous on top of the mashed potatoes we had!) and my family raved about how tender and perfect the beef was. 3) finally, my parents said we should make this meal a tradition every year! I was so touched by that and had to thank you for an incredible, super easy, recipe. Your blog is addicting and I honestly go around showing your photography style to my fellow foodies. You’re the best! 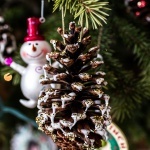 Have a great holiday season! Tieghan, last night I made this Gorgonzola (I used blue cheese) sauce, but with your Beef Tenderloin with Pancetta recipe. I wanted to do this exact recipe, but my grocery store didn’t have the standing rib roast in stock, so I improvised. I’ve never made a whole beef tenderloin roast before, and I was nervous, because it was for a big, yearly traveling Christmas party for our family, but I gotta tell you, it was a HUGE SUCCESS! Seriously, I’ve made about 10 of your recipes so far, and only one of them didn’t work too well (it was my fault, I didn’t follow the recipe) and several of them have been so good that they’re now added to our permanent family list of ‘must make again’ recipes. You might be young, but you’ve got serious talent in the cooking department. It’s fun looking through your blog and deciding what surprise delicious meal I’m going to try next. Thanks! This has been our family’s go to Christmas meal for years. Love the idea of the beets, I noticed you did NOT peal them? Do you eats the skins or cut it off table side? We cook med. and any one who wants it more done I have heated beef stock on the stove and can place the sliced meat in it for a moment to a min. and the meat is to their liking! Hey Lori!! I eat the skins, love them, but please feel free to peel if desired. And thank you for that beef broth tip, that is genius! Hi Michelle, I am sorry, i think I am confused. This recipe does not have any mushroom in it. Are you referring to another recipe? I can’t find the video to this recipe! HI! I am so sorry for the trouble. I can see the vide. What browser are you using? this is my first time to you blog through Pinterest, I love love your post! However, I cannot find the video of this post, Did you mean for some videos else?! This looks amazing. Any recommendations for a sauce substitute for folks that don’t like stinky cheese? Thanks!